Always on the lookout for great places to explore in Italy, this past weekend we headed to a real gem – Parco delle Cascate in the province of Verona. 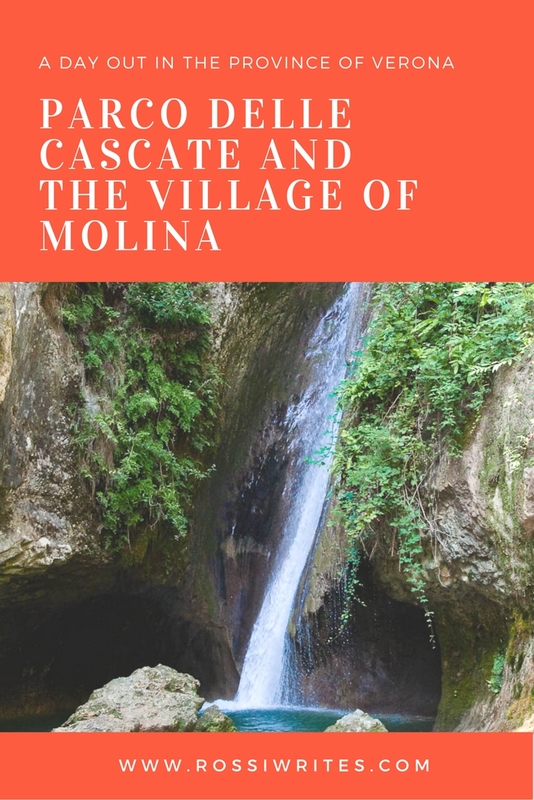 Cascata means waterfall in Italian and the park more than lived up to its name, being home to eighteen stunning waterfalls and several pre-historic caves. We hiked from one to the next through a lush forest following a well marked trail. It took us down to the bottom of a steep hill and then up again scaling it all the way to the top. Even though we spent several hours walking, I felt re-energised and just happy to be there. We finished the day with a quick visit to the village of Molina which overlooks the park. Its houses drew us in with their fabulous rooftops made of heavy slates of rock. As an added bonus, we also visited two mills and a dairy where a ricotta-making demonstration was taking place. 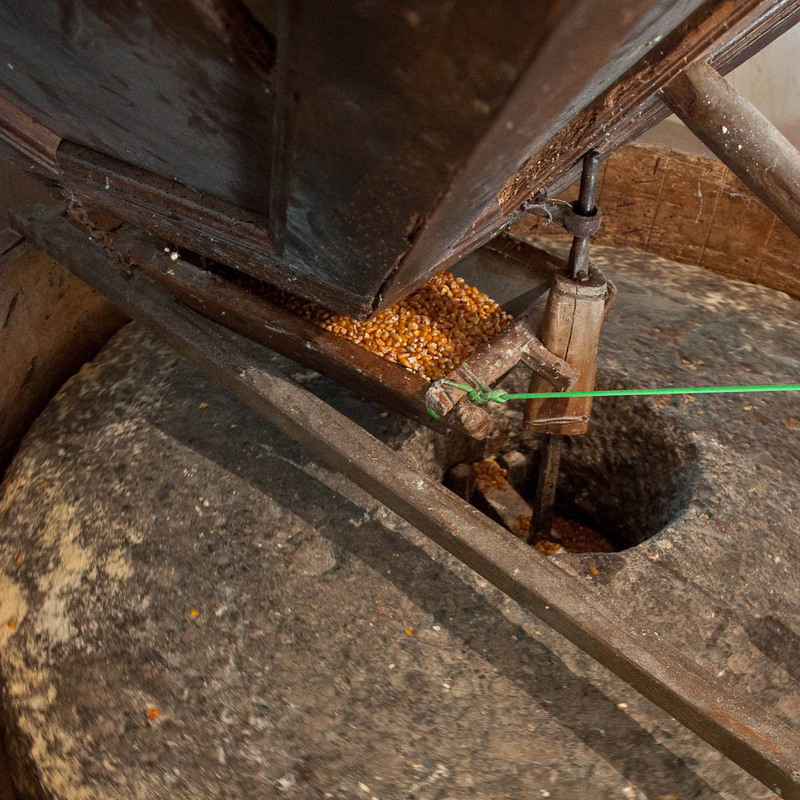 One of the mills dated back to the 1600 and was still in use today stone-grinding polenta. All in all, it was a great day and it comes highly recommended if you are looking for a day out in the open in close proximity to Verona and/or Vicenza. Read below for further details about the different experiences you can have in Parco delle Cascate and Molina. 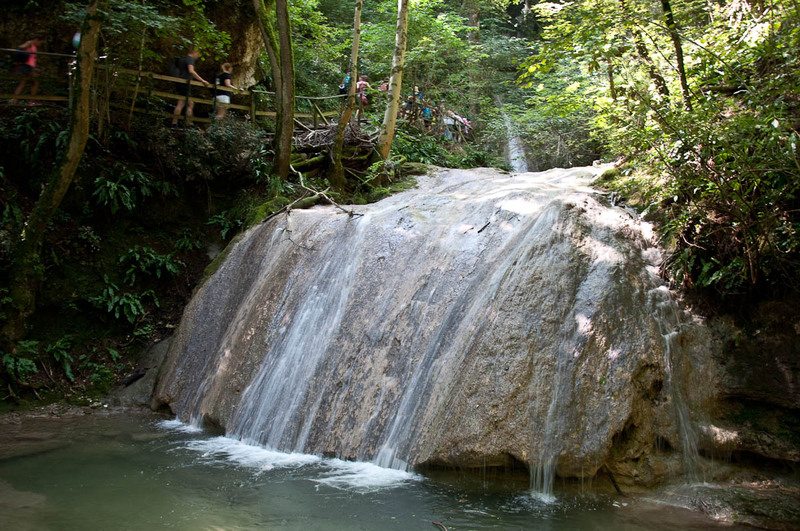 Parco delle Cascate is a beautiful nature park nestled between three lush valleys. It is surrounded by dramatic peaks and it is famous with its chain of 18 waterfalls. 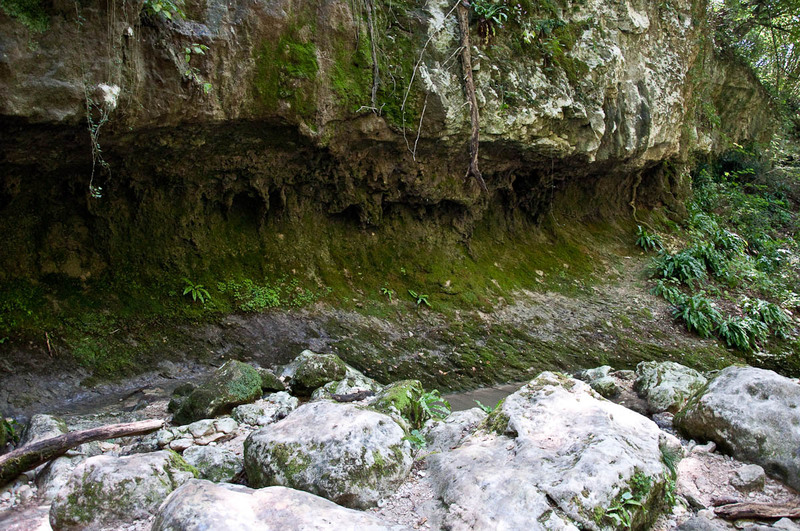 On its territory you can also visit some pre-historic caves and see how people used to live many thousands of years ago. The park is easily reachable from both Verona and Vicenza. In our little red car it took us about an hour and twenty minutes to get there from the latter and we would have been quicker had the GPS not stopped working right when we were negotiating the maze of roads after the exit from the highway just past North Verona. Once the GPS signal was restored we quickly found our bearings and the road took us through the famous vineyards of Valpolicella where large bunches of blue grapes were bursting with sweet juices under the sun of Veneto. From then on the road sneaked and curved through higher and higher green hills. The car lanes were narrow and often bordered on one side by deep precipices, yet drivers were rather impatient, overtaking each other and taking unnecessary risks. We just took it safe and steady. Soon, we could glimpse the village of Molina and its beautiful slate rooftops. The line of cars had slowed down and we noticed a local gentleman who was directing the drivers where to park. We followed his instructions and after a descent down the side of a steep hill, we spotted the free parking lot on both sides of the local cemetery. There another gentleman was organising the never-ending stream of cars, motioning to them where to park. We opened the doors and were met by the heady scent of sunny day and green grass. A large grasshopper took this opportunity and jumped into the car. We marveled at its size and then promptly shooed him out. 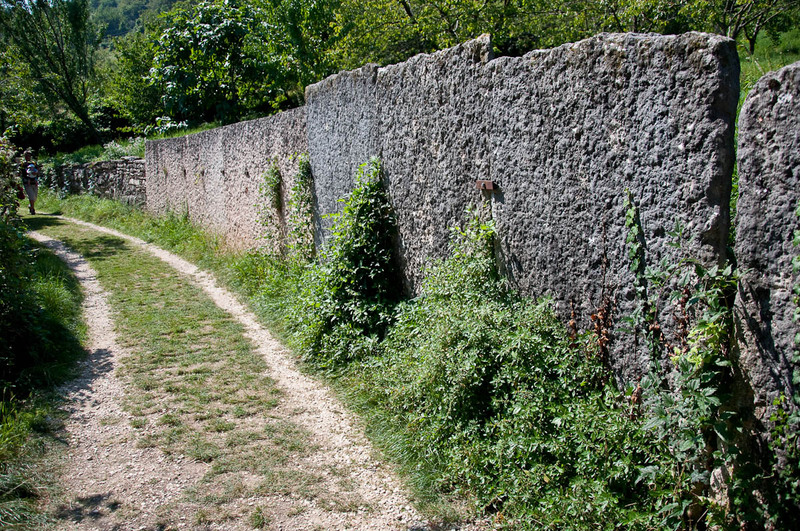 A large comfortable path took us from the car park all the way to the village of Molina. If you walk fast, you need perhaps less than ten minutes to make the trek. 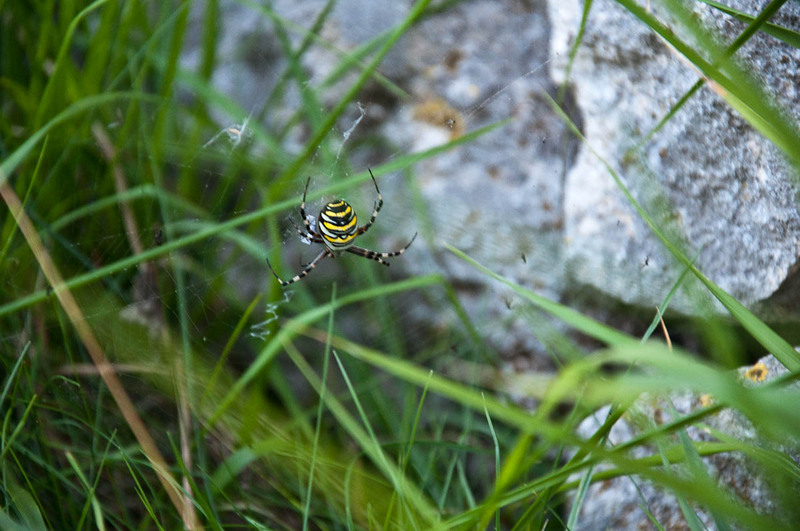 It took us double this time, as we were stopping every now and then to admire the view and look at an abundance of local insects – from snails to this huge striking spider. 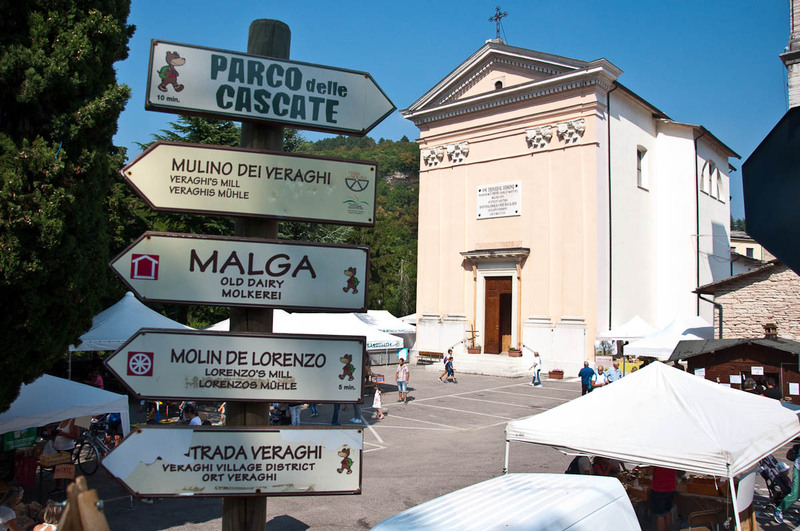 Once we had turned into the village, a sign pointed towards the bottom of the hill where Parco delle Cascate was located. The path was alternating between gravel and slate, the latter of which could be quite slippery especially on the sloppy bits. A steady flow of people walked down the path with us. Further down a pair of goats and a pair of donkeys were munching grass. 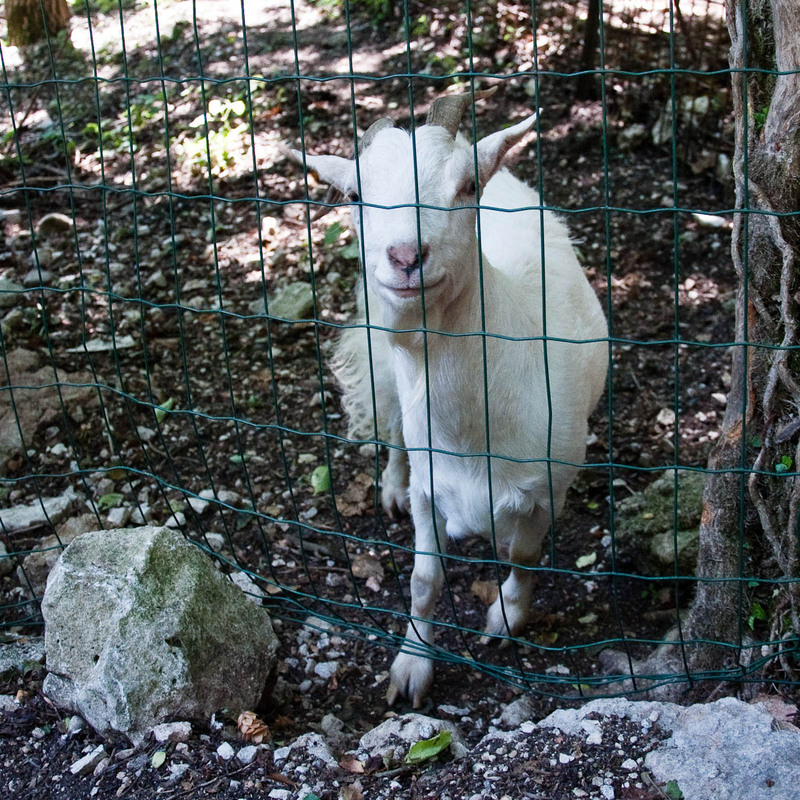 We stopped to say hello and to feed them some slices of apple through the fence. Finally we reached the entrance of the park in front of which a long queue curved up the hill. The wait was quick though and it all felt really organised and relaxed. No pushing and shoving, no queue-jumping and passive aggressiveness. The park visitors seemed to be of any age – there were lots of families with a myriad of kids of any size but also many couples and groups just wanting to have a picnic in the bosom of nature. We paid (the adult ticket is 6 euros) and walked in. A polite young man at the entrance kindly gave us information about the available facilities (there are toilets and a couple of bars and a kiosk selling drinks and food) and then encouraged us to do the red trail. Green – 1.2 km, easy and it takes about half an hour to do. Red – 2.3 km, medium and requiring on average an hour or so to circle it. Black – 3.6 km, difficult and needing two hours at least. 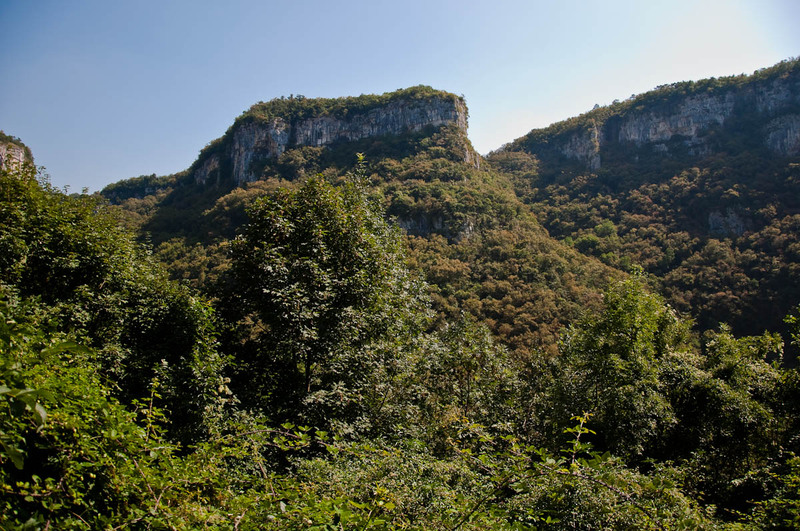 We had planned to take the green trail, as we are still so new to this hiking thing, but the young man assured us that the red trail was more than doable with a small child and it would also give us a chance to see the caves and all 18 of the waterfalls. 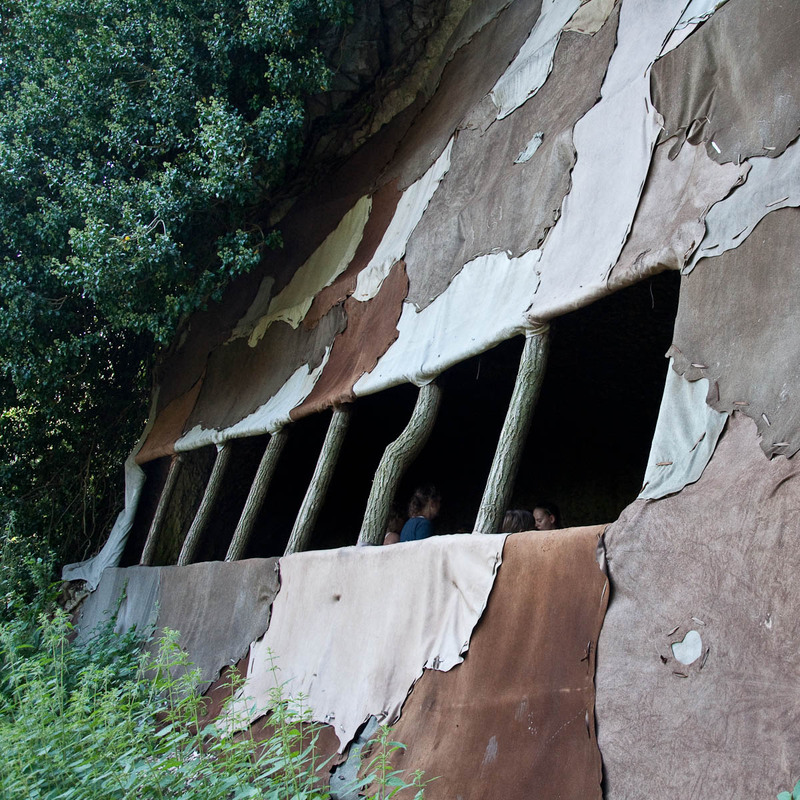 First, we popped into the large pre-historic cave, all draped in animal skins. Inside we found a large fireplace to give us an idea how people used to live and prepare their meals thousands of years back. The ceiling above it was black with the soot of many fires which had burned there such a long time ago. Then we followed the well signposted path. It took us all the way down to the bottom of the valley. It was easy to walk on and wooden railings provided a welcome support at the steeper points. 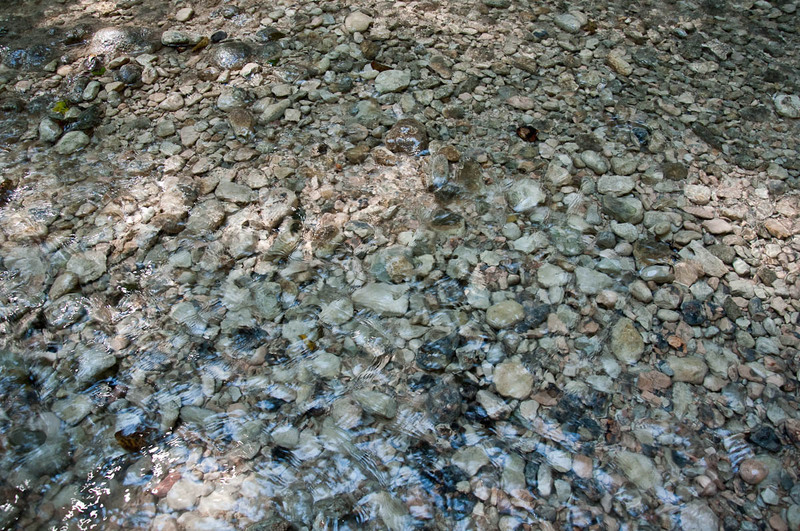 A clear stream with cold water and pebbly bottom was running there and families had sat down for lavish picnics and a well-deserved rest. In the pools we spotted large brown trout. Apparently, they were also home to freshwater crayfish. A few more minutes of hiking on the uneven, rocky and at places rather muddy path and we found ourselves in front of our first cascata – the Bear Waterfall (the very first photo at the top of this blog post). It was falling fast and furious from a rather big height and people were crowding around its pool to take pictures and to admire its beauty. From there, we followed the signs climbing up the face of the hill. There were lots of hikers, but the ambient was friendly and relaxed. We walked quite slow, taking it all in and stopping at every place which caught our fancy. There were great views to be admired and every new waterfall we saw surprised us with its shape and fast-paced waters. Only once we hit a bit of a glitch. Right above the Bear Waterfall a narrow metal staircase led up to a narrow metal walkway with stunning views over the valley and yet another waterfall. With one of us suffering from severe vertigo, we weren’t sure if we could navigate the walkway. That was until a very kind Italian man saw us standing there wondering if we should turn back and he offered to help us through. 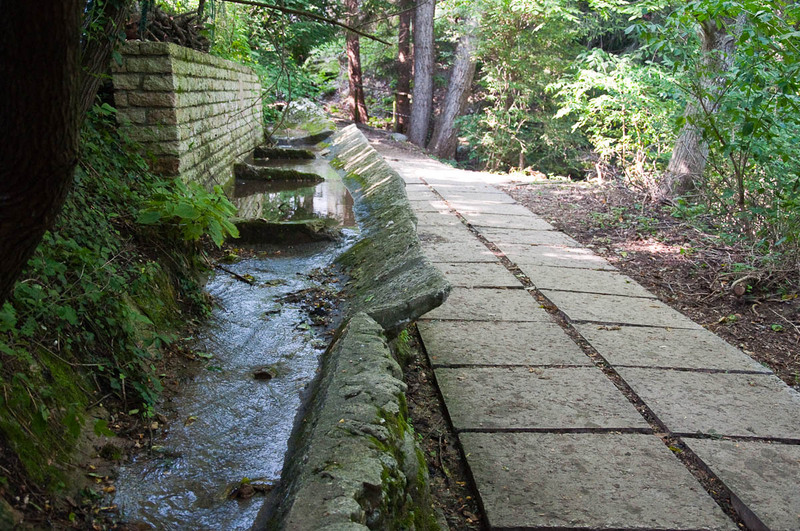 The walkway is easy to navigate and, if you can’t bear it, it helps having someone holding onto your hand. Just don’t look around and walk as fast as you can and before you know it, you will be on the other side. 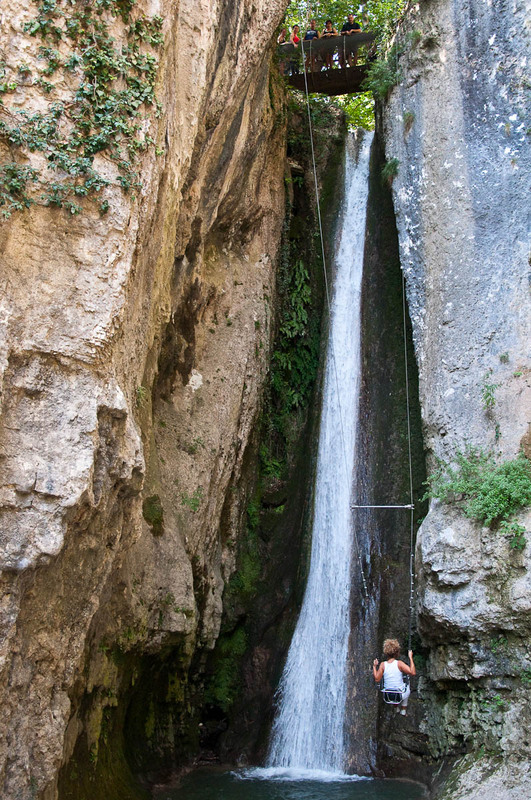 With all this beautiful nature all around you, a great addition to the park were the waterfall zipline and the waterfall swing giving you a chance to experience the waterfalls from a unique point of view. Unfortunately, the queues for both were rather large, so I missed my chance to go on the swing, but I would be more than happy to go back to the park for another dose of nature and renewed energy any time soon. 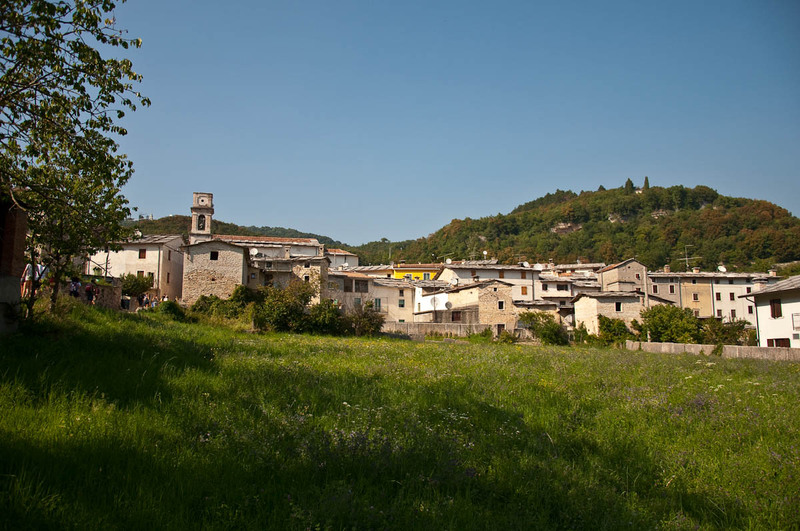 Once we had finished at Parco delle Cascate, we trundled up the hill towards the magical village of Molina. Its stone houses and slate rooftops were calling me loud and clear. Right on that day the village was celebrating a feast of the honey and a small farmers’ market had set up its stalls along the main street. 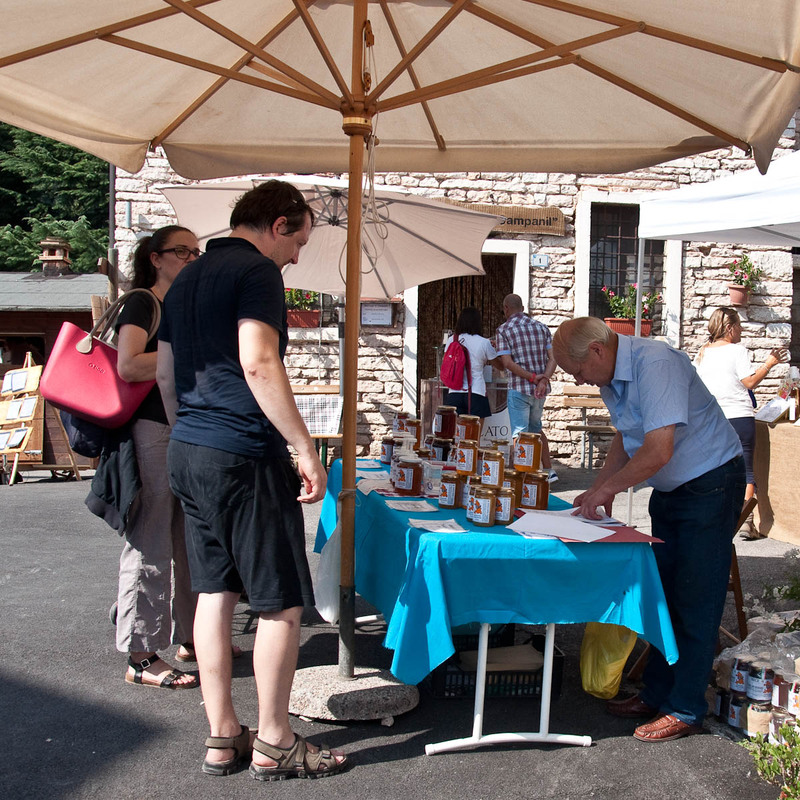 Local producers were selling different types of honey, hazelnuts, fish specialties and so on. People were milling around and it all had a very relaxed and happy atmosphere to it. I particularly loved seeing the stone houses up close. They were so whimsical in their design. 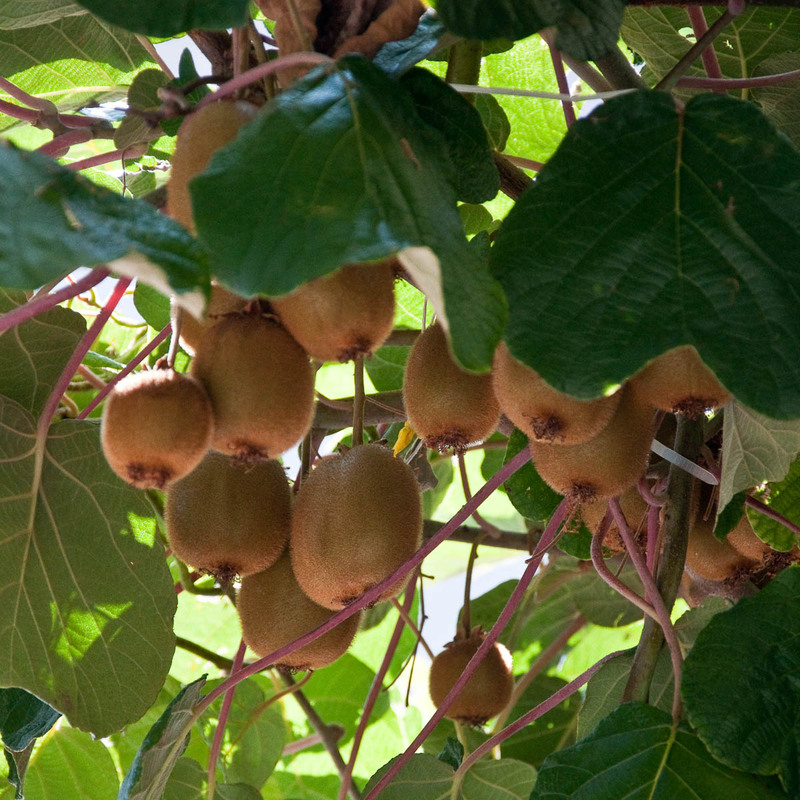 The biggest surprise though was spotting a huge trellis vine in front of one of the houses, which at closer inspection turned out to be a big kiwi tree dripping with fruit. 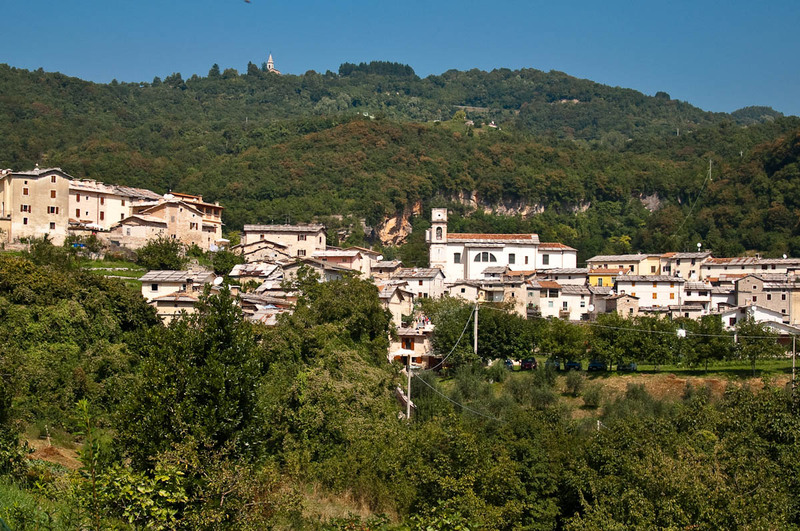 If you visit Parco delle Cascate, make sure that you set some time aside for a visit to Molina, too. It is an enchanting place. A lovely bonus during our day out was the visit to the local mills and dairy farm. Large signs in the centre of Molina pointed us in the right direction and the local people we asked assured us that the trek to the mills through the green forest surrounding the village would take less than ten minutes. 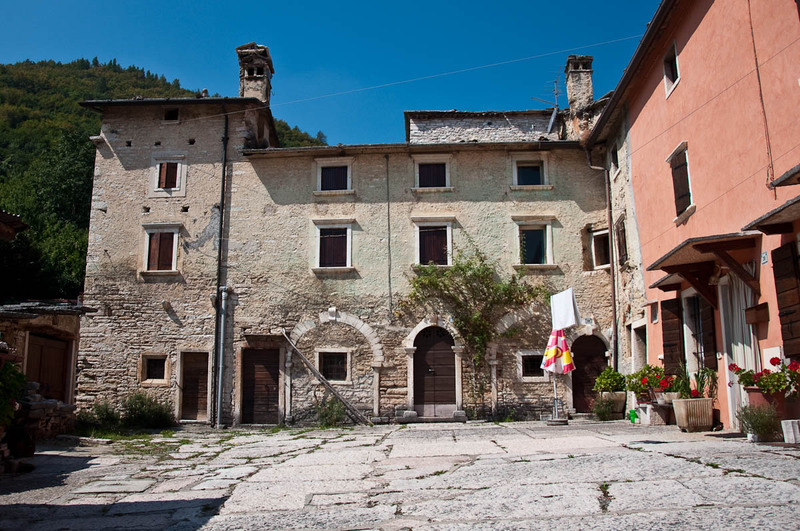 Molina in fact means ‘mill’ in Italian and since about the 10th century the village used to be home to many mills (17 at its heyday). Nowadays there are two left. 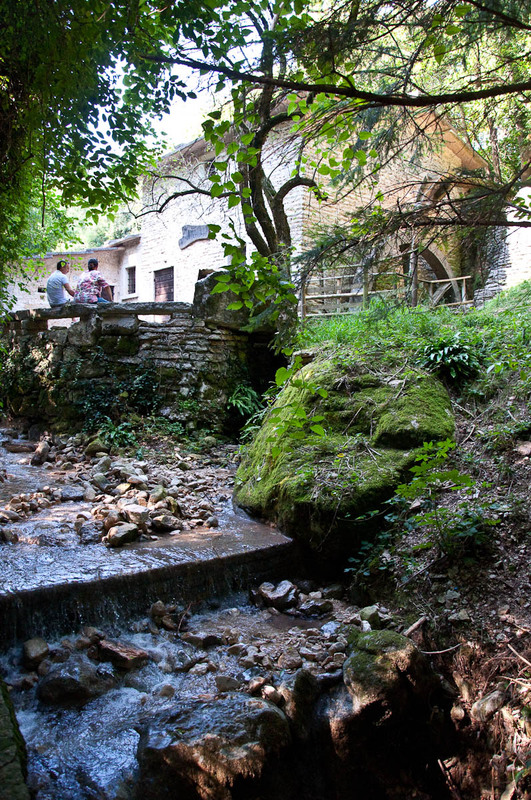 One – Lorenzo’s Mill – has recently been restored with view to use it for organised visits. It was originally built in 1766 and just until after the end of World War I it was used for pressing wool and grinding cereals. We walked past it admiring its wheel which was slowly turned by the fast flowing stream. Just up the road from there, we had our first glimpse of the Veraghi’s Mill. I was in love. Surrounded by tall lush trees, the mill had been standing at that beauty spot for over 400 years. 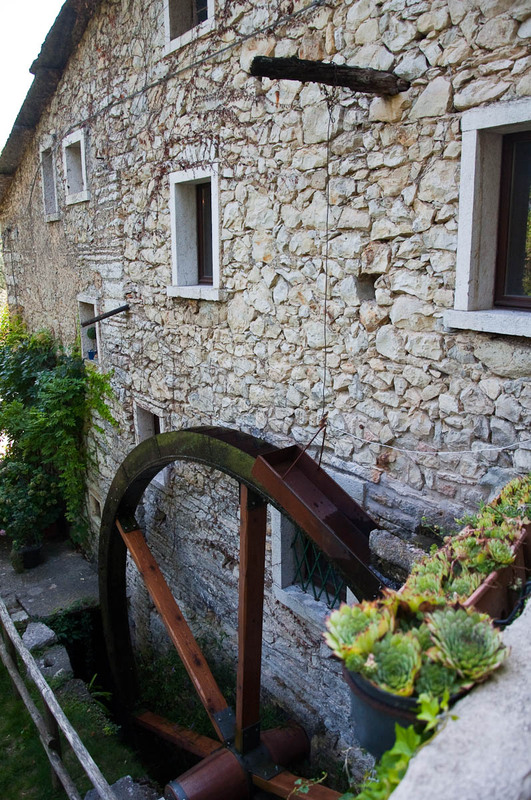 It is the only surviving mill from the original mills which gave Molina its name. 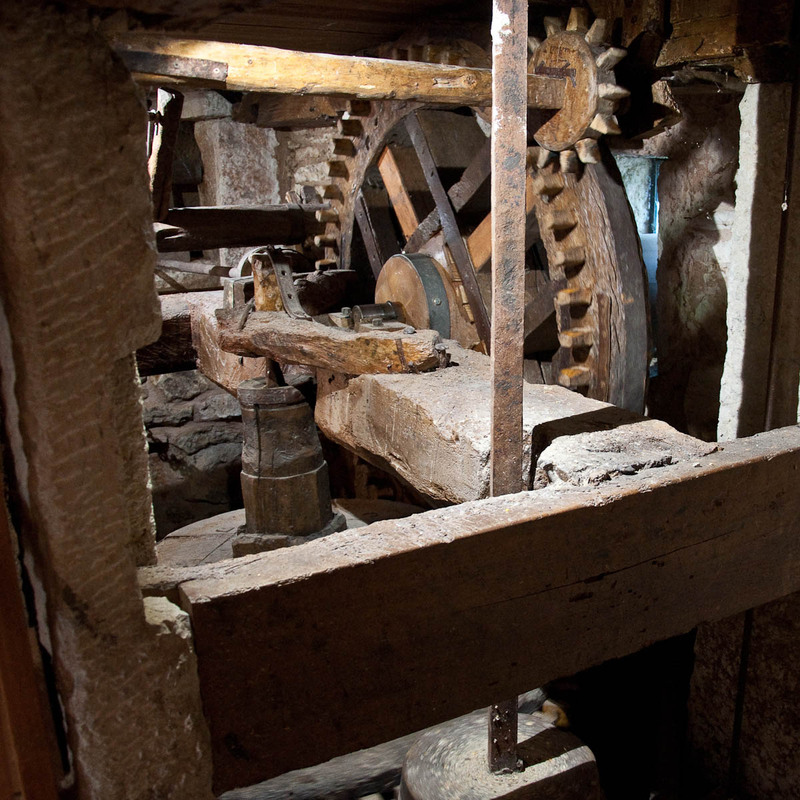 It is still in operation nowadays and its big heavy stones moved by a set of wooden gears still mill polenta as in the days of yore. We had a look around it, admiring the slow turning stones which were grinding corn to fine dust. 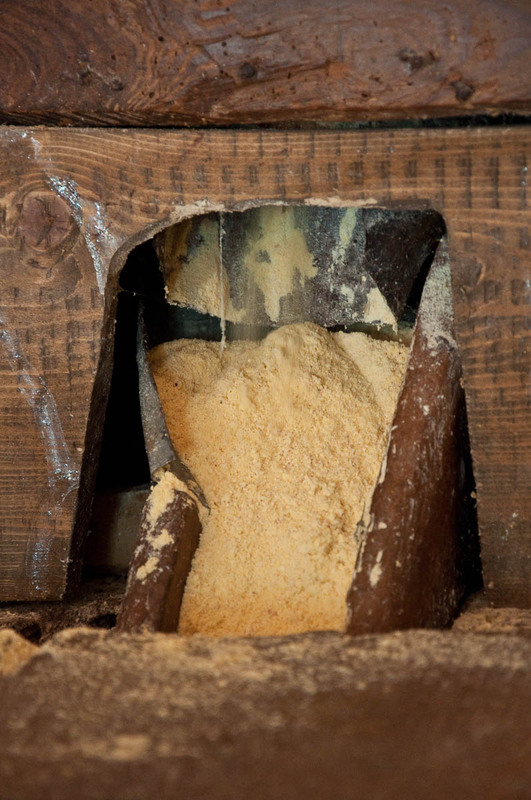 We saw the collector enrobed in fine mesh through which the polenta slowly sieved on the bottom of a large wooden case. 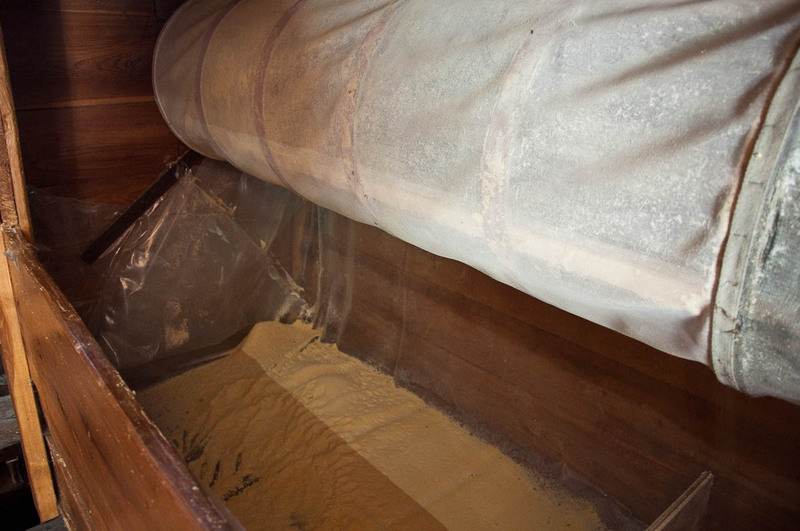 A duct would then transport the large bits out and straight into a waste bag. Outside the sun shone on the stone building of the mill surrounded by creepers, flowers and sweet peas. On the way back into the village, we also stopped by the local dairy farm, called La Malga Turnaria. It was founded in 1879 and nowadays the building is used for workshops, but over a stretch of one hundred years it was where the local dairy-farmers would bring the fresh milk and then turn it into tasty cheese. 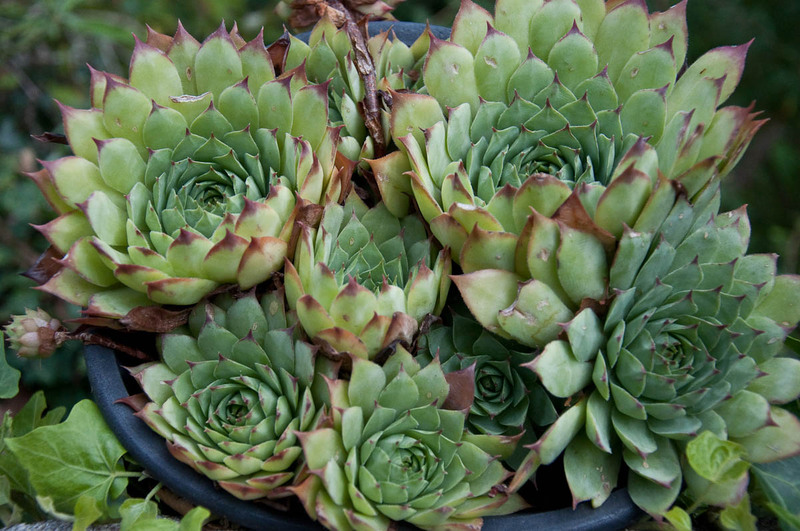 La Malga Turnaria worked on a principle of ‘taking turns’. 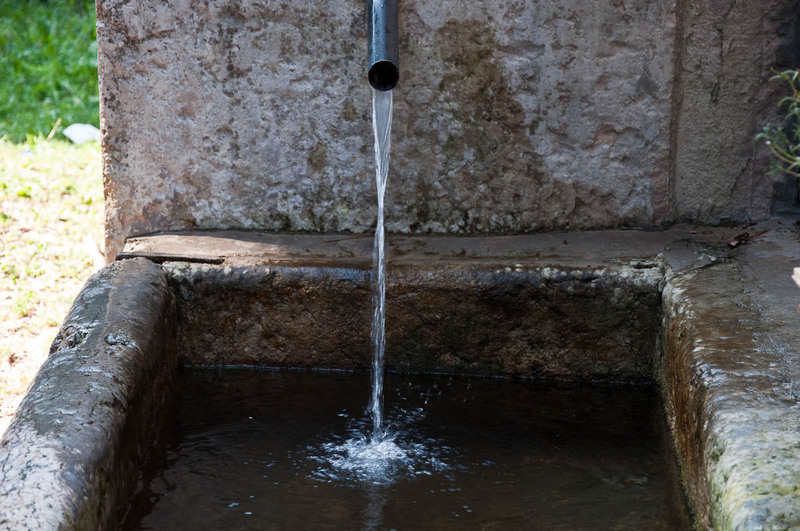 In other words, each day each member of the collective of dairy-farmers would take to the Malga its cows’ milk and write the number of litres on a specific measuring tool. The quantity was then added to his credit or debit. The member with the most credit could take everybody’s milk and use it to make cheese. The litres of milk used were then subtracted from his credit. He would then repay the used quantity of milk by bringing his milk to the Malga in the following days.This way, each member would have enough milk to make cheese for his family. When we were there a ricotta-making demonstration was taking place. The small building was bursting with people eager to learn more about this ancient craft. We also had a very quick look inside just when a fresh vat of ricotta had been obtained. The smell was pungent and overwhelming. People were squishing to the front to see in the dim light. From where we were standing we couldn’t see much, so decided to come back during our next visit to the place. All in all, it was a great day. Definitely, one of my most favourite short trips in Italy so far. 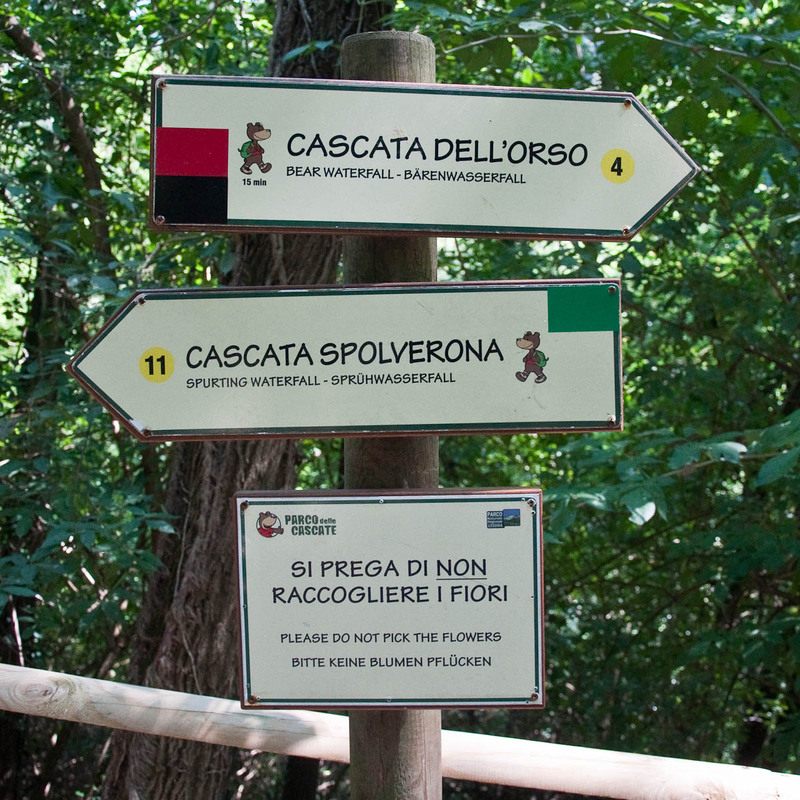 For more information, please, refer to the official site of the park at www.parcodellecascate.it. Kindly note that the above is a recollection of my personal experiences at the place. I have not been sponsored and/or remunerated in any way for this account, it is just an honest first-hand experience shared with you. 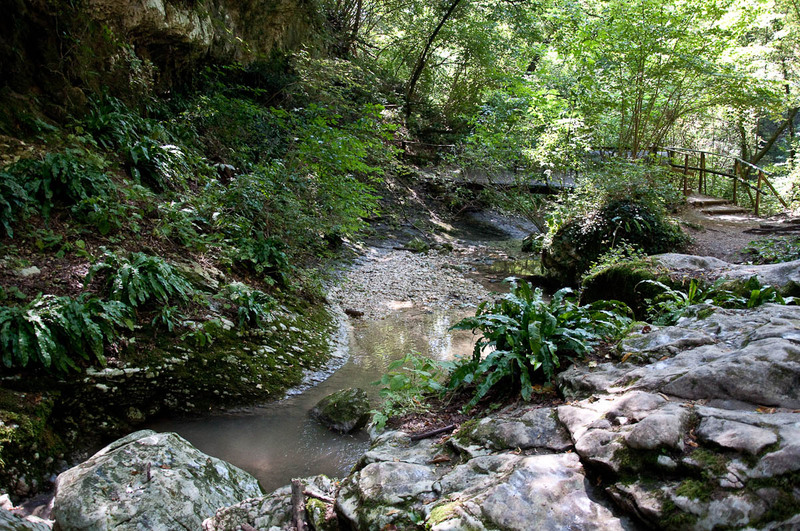 Have you been to Parco delle Cascate and Molina before? Let me know what you thought of them. Also, what else would you recommend visiting and experiencing in Veneto, Northern Italy? I would love to read your comments in the section below.